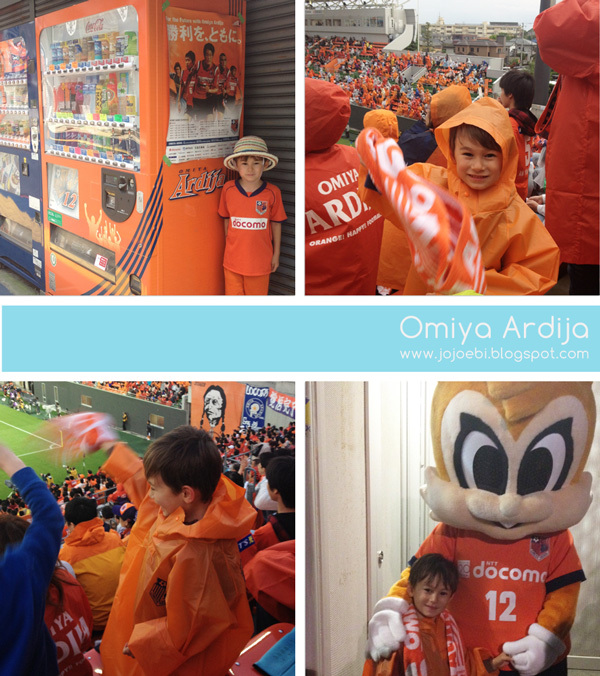 jojoebi designs: Come On Orange! At the start of the day it was lovely, warm with a slight breeze but as we sat waiting for our friends to arrive the skies went black, they made announcements that a thunder storm was on it's way. Ebi-kun and I went downstairs just before the heavens opened and a few minutes later they cleared the stands because of the risk of lightning striking so we ended up in the basement car park with the team bus! It turned out that lightning hit a house then next town over from where we live and in Ibaraki there were crazy tornadoes. The weather has gone mad. Anyway, once the storm had passed we returned to our seats, our friends turned up and we got the beer in! The kids really enjoyed themselves, I think I can speak for all the moms that next we will go to the pub and leave the kids with the dads, it is much easier to have a gossip when you haven't got a bloke chanting in your ear. The kick off was actually postponed for an hour so we were late getting home and getting Ebi-kun to bed, tut, tut on a school night and all that. I discovered the second day into the holidays that the reason Ebi-kun was getting up so early (5.30am) is because sensei had told the kids not to get up late just because it is a holiday! Fair enough BUT I do not think getting up at 7.30am is getting up late, in fact for us, that is a lie in. I told Ebi-kun that if he insisted on getting up at stupid o'clock that he wasn't to come and tell me he was hungry, he can phone sensei and get him to come round to sort his breakfast out. I bet sensei was lying in bed 'til midday having a good chuckle at our expense! "I told Ebi-kun that if he insisted on getting up at stupid o'clock that he wasn't to come and tell me he was hungry, he can phone sensei and get him to come round to sort his breakfast out." This made me spill my coffee laughing, especially the part about "stupid o'clock." I didn't grow up in a house where football was popular, my dad was never into football, rugby or cricket and my brothers never really got into either. I don't mind going along, it is a nice atmosphere but I hadn't seen the other girls for a while, it would have been nice to have a quiet catch up! as for baseball - I have no idea about it! Not anymore actually, as our team is J2. Hopefully they can play each other eventually. 5:30 is indeed stupid o'clock. I'm surprised Omiya hasn't gone down yet, they always start the season strong and slowly get worse and worse!